Seems hard to believe exactly a year ago I was in the 4th week of my chemo and radiation treatment. It was just about this time that I really started to feel the effects of the treatment and was becoming pretty darned ill. I sure am grateful to be looking back on that journey instead of facing it! I had my first “annual” CT Scan on Tuesday, September 7th. The night before, I began drinking the berry-flavored barium sulfate suspension “smoothie” – oh, joy! As you might guess, it does NOT taste like a berry smoothie – the stuff is horrible! Then, nothing by mouth after midnight, including water. More barium drink at 7:oo AM. More barium drink when I arrive at the hospital, and then more as I’m getting on the table at 9:00 AM. It was the first business day after the long Labor Day weekend and the hospital lobby was packed. I waited nearly a half-hour just to get through “registration” and the time scheduled for my scan was rapidly passing. I continued to wait more-or-less patiently, but I soon noticed I was becoming more agitated by the minute. I finally approached the registration desk to ask what I should do now that I would be late for the appointment, and a rather unfriendly gal barked at me: “I just got your paperwork!” I said I wasn’t upset with her, just anxious about the time. The rest of the registration process was a rather “chilly” affair. When I finally got to Radiation, I waited some more. By then I was becoming a little dizzy. I hadn’t had any food or drink (other than barium!) since the night before. It was ice cold in the waiting room. My scan was scheduled for 9:00 and it was nearly 9:30 now. By the time they called me back for the scan, I was shivering, dehydrated and tense. 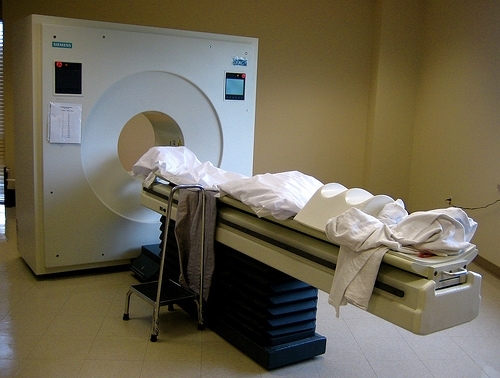 The room where the scan takes place is kept at about 50 degrees for some reason. So, of course the tech couldn’t get an IV in me again! They finally brought me a pile of warm blankets, and recruited a very sweet nurse with a gorgeous pearl necklace to come try to find a vein. She was so kind and managed to get me settled down in no time. I just kept staring at those beautiful strands of pearls as she expertly got an IV going without difficulty. The scan itself lasted about five minutes, with the table moving in and out of the “doughnut” three or four times. Each time, a mechanical voice would tell me to “take a deep breath in and hold it there.” Then after a few seconds it would say I could breath normally. But the taped voice was so garbled at that point, I could have sworn it was saying, “Karen, you breathe!” in some strange foreign accent. I saw Dr. Fekrazad and his N.P. Cynthia on Tuesday the 14th to review the results of the scan. Basically, everything looked good, although there was a “vague spot” the radiologist couldn’t identify at my sacrum. Both Fekrazad and Cynthia seemed to think it was most likely scar tissue from the surgery (“nothing to lose sleep over”) but just to be sure they want me to have a PET Scan now. 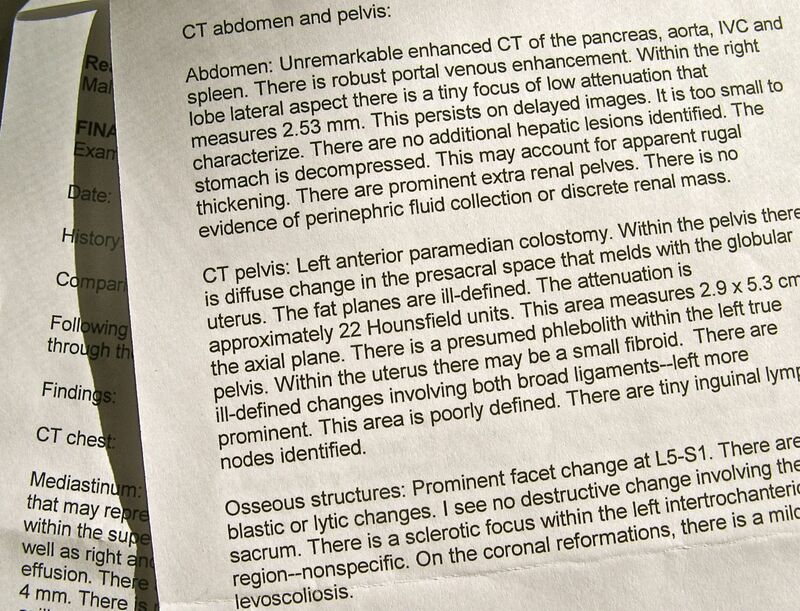 The actual language in the report of my CT Scan. The medical jargon makes it ridiculously scary to read, but apparently most of the results are fairly "normal"
All else was “normal” – including: some mild degenerative bone stuff in my shoulders (probably hereditary); a cyst in my liver (supposedly we all have them…hmmm); some minimal scars in my lungs (probably from pneumonia in my teens); a small fibroid in my uterus (“nothing to be concerned about”); dense breast tissue (again, hereditary); and – well, on-and-on. Sheesh! Offer them a few rads of images and they take a mile! I’m not so sure it’s a good thing to know all this stuff about our inner workings. Doesn’t it seem like there ought to be some mystery left? All kidding aside, the scan ultimately showed that I’m in good health overall – and, although I need to go back for a PET Scan on October 6th, I’m confident it will reveal only scar tissue and nothing more serious. As always, I’ll keep you posted! I am very happy you got your health back. I can barely imagine how scary it would be to go trough that kind of exams again after what you have gone through. I really enjoyed spending some time with you this past summer. I do miss Yoga Source, think of me once in a while when you go there! Carol is on her way to Santa Fe, how cool is that! HI MIss K…SOOO happy to hear you have good results! Wow! You are a good writer and…you are brave to go thru that alone. I mean…the waiting and being delayed and the time after….not in the tube…silly!!! You inspire me everyday and I thank you for sharing! And you made me laugh too. I am darned glad to know you sista! You’re amazing. Strong, witty, adorable, beautiful, immensely independent. Was thinking of you lots this morning and how time has flown. Am so thankful for the good news.